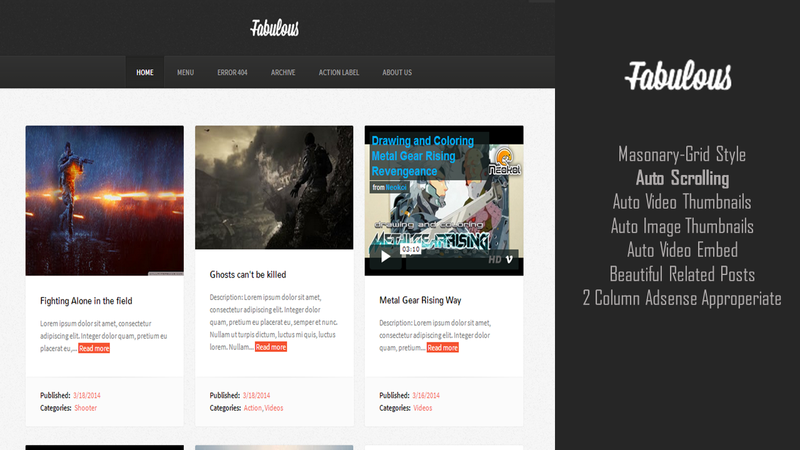 Fabulous Blogger Template is a Modern Responsive blogspot theme having masonary grid style that has many premium options such as auto scrolls, auto video and image thumbnails. It is a beautiful way of showcasing just about anything. Its responsive design a supports many device’s screen resolution of many electronic devices including medium and large. Its post page has simple 2 column which is extremely effective with a focus on pageviews by providing custom related posts widgets and sample room for sidebar adsense codes and inline. It is fully Adsense ready web-theme that easily customize with adsense without having any issue. It has WordPress looking style and structure that is clean and eye-catching such as it has beautiful WordPress look Drop Down menus etc. By using this web design you can easily start your website with a fabulous impression on users and readers. You should hopefully use Fabulous Blogger Template on your website to make your site more professional and user friendly.